Home / Old Try / First sale. Picked up the first batch of 5 designs. So I have 500 to sale. 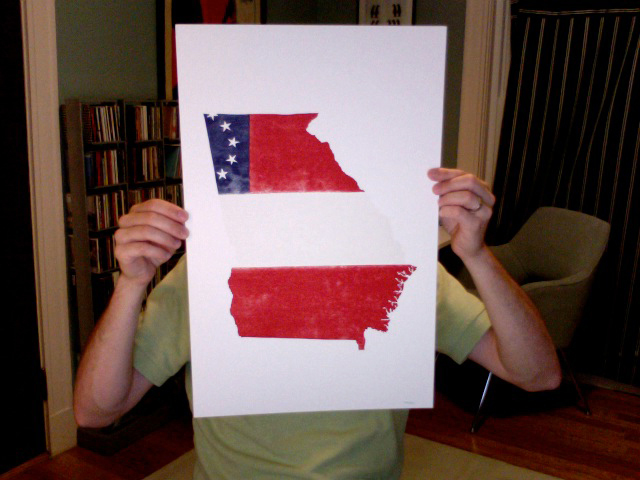 I'd sold the first Georgia flag to a friend who was helping me on some Old Try administrative stuff. So, at this point, we have money in our bank that we earned with the sweat of our brow, and a poster en route to a wall. I thought about framing the first dollar I earned of my first sale, but since it's Paypal, that would look kinda lame. First one to give me cash might end up in a frame on our wall.